PHUKET: Dr Sommai Prijasilpa became Phuket’s first female vice-governor when she took up the position on January 9 this year. Before moving here, Dr Sommai was the vice-governor of Mukdahan, in the northeast. Phuket now joins seven other provinces – Phichit, Sakon Nakhon, Chachoengsao, Prachin Buri, Chai Nat, Ayutthaya, Prachuap Khiri Khan – that also have women as vice-governors. Dr Sommai was born in Bangkok, and graduated with a bachelor’s degree in philology from Thammasat University along with two master’s degrees from Thammasat University and the University of Scranton in Pennsylvania. She then went on to receive a doctorate in education administration from Illinois State University. Before moving to Phuket, she was the vice-governor in Mukdahan, in Thailand’s far northeast, from 2008 until the end of 2011. For the first two years of that posting she was in charge of the economic and social portfolios, and afterwards took on security. Mukdahan is a “countryside where people had an idyllic lifestyle”, and are at one with nature, she says. Phuket, too, is surrounded by nature but is far more urban, and is very different both economically and socially. Dr Sommai told The Phuket News that before she started working for the government, she was a volunteer in a rural development camp for three years after the October 14, 1973 Thai revolution, helping to educate people in Suphanburi about democracy. That job lead to her working for the Office of Accelerated Rural Development. She didn’t need to do a great deal of research before being posted to Phuket, she says, because she has visited Phuket once per year for a long time. 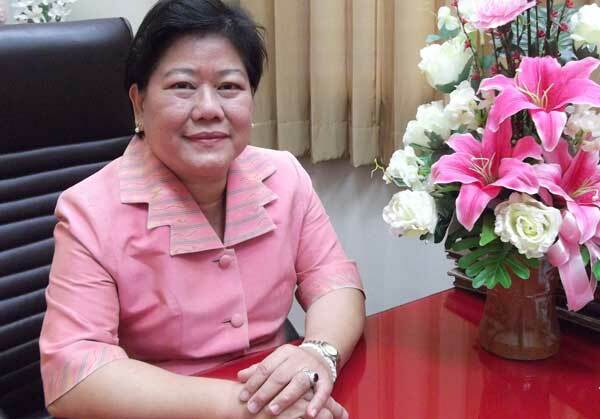 While vice-governor in Phuket, she will deal with managing and developing public health, environment, public works and country planning, tourism, and foreign relations. One of the urgent issues for Phuket is to focus on tourism, and improve the overall image of Phuket, which could be improved by better public relations, she believes. Phuket recently launched a road show around Thailand to promote tourism in the Andaman region. She hopes the Asian Beach Games, planned for Phuket two years from now, will also help promote tourism and lead to sport tourism development, such as extreme outdoor activities such as bungee jumping. She believes tourists see Phuket as a marine tourism centre, but the island has traffic problems that need to be addressed, and she believes that more sophisticated technology, such as an island-wide transportation service, possibly a light rail system, would be a big help. Another point of concern, she says, is to ensure that migrant labourers have access to good medical care. She hopes that all of these can be registered with the Social Security Office, which can provide assistance with medical treatment. The preservation of the environment and tourist safety are also important, she said. Dr Sommai describes herself as an easygoing person with a passion for travel, and she likes to be surrounded by like-minded people. When she first arrived in Phuket she was impressed at how welcoming people were, and at the high quality of souvenirs and local food with its unique packaging. As with all senior government postings, Dr Sommai will most likely stay in Phuket for no more than four years.